Beijing has so many exceptional dishes and snacks that first-time travelers may not know where to start. To cut through the confusion, Culture Trips presents eight must-try local favourites. The three things that everyone who comes to Beijing must do: Eat Peking roast duck; climb the Great Wall; and visit the Panjiayuan Antique Market. Check out Quanjude. Founded in 1864, the restaurant inherited its representational “roast duck in stove” from the imperial court, priced from 238 RMB yuan (36 USD), according to the duck’s quality. Quanjude has nearly 20 locations all over Beijing. The most famous snacks bar in Beijing is the Huguosi Snacks chains. While there are dozens of snacks to choose, there is one snack that you should never miss: Wandouhuang (Pea Cake). Once the favorite snack of the Empress Dowager, the pea cake is known for its golden imperial color and its sweet yet fresh taste of peas. Huguosi Snacks has many locations in Beijing, and the biggest one its flashship store on Huguosi Street. Beijingers have a thing for dishes made from intestines. Their famous dishes of pig intestines include luzhu huoshao, baodu and stewed liver. Stewed Pig Liver and Fried Pig Lungs have been around since the Song Dynasty. The stewed pig livers were served in soup thickened with starch afterwards. 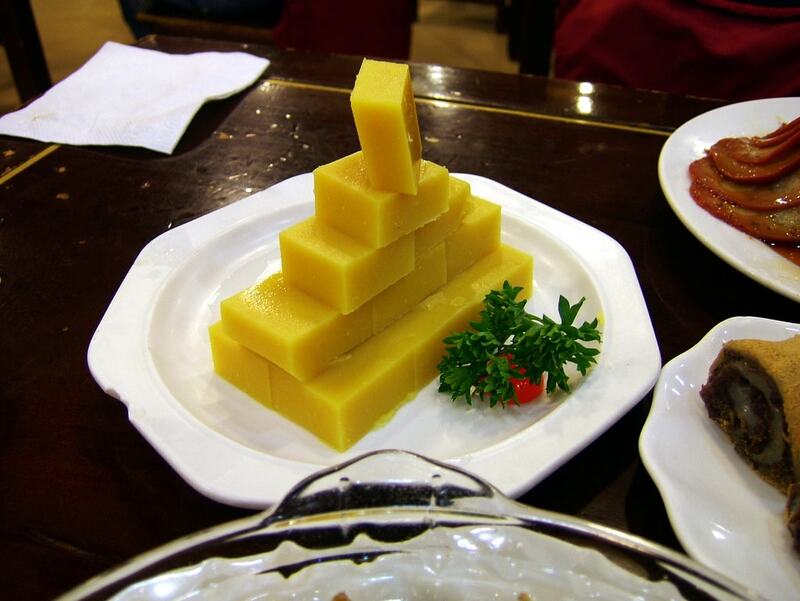 You can still get the original Huixian taste at the Tianxing Restaurant,. After having greasy roast duck, how about a refreshing Old Beijing drink? This drink boiled from sweet pears and added edible white fungus, crystal rock sugar, green plums and Chinese Wolfberries is a nutritious drink that is supposed to be good for your throat and lungs. You can try the drink at most of the Beijing cuisine restaurants like Juqi and Xiaodiaolitang, where the drink is served in vintage-style thermos flasks, mostly used in the 1960s. Here’s a must-try dish for veggies. Named after the Qianlong Emperor in the Qing Dynasty, legend has it that the dish was ordered by the emperor at a small, nondescript restaurant during his tour outside of the imperial palaces in disguise and was spoken highly of by him. Though made of cabbage leaves with sesame sauce, vinegar, and honey (and sometimes with black sesame seeds atop the dish), it has been one of the most famous traditional dishes of Beijing and can be found in most of the Beijing cuisine restaurants today. Beijing is known for its fried sauce noodles, also known as noodles with soybean paste. It is a dish of thick wheat noodles mixed with sauce made by simmering stir-fried ground pork or beef with salty soybean paste. All locals know Hai Wan Ju has the best fried sauce noodles — you will not only eat the noodles but experience the ritual. It is served in a giant bowl with sauce and garnish, like shredded cucumbers and soya beans, each put in a small plate and laid around the bowl. Compared with this, the DIY burgers they offer are nothing. If you have taken a stroll in the hutongs in winter, you may have noticed the copper giving off steam in front of some restaurants. Those are the pots that the traditional Beijing Mutton Hotpot uses. If there’s one mutton hotpot restaurant you should go, it must be the Jubaoyuan Restaurant on Niujie. Apart from the top-quality mutton slices, it also offers a limited supply of sesame seed buns. The two Jubaoyuan restaurants on Niujie always have a long queue during rush hour, so you have to make reservations in advance. This traditional wheaten food of Beijing is one of the childhood favorites for many locals. It is very easy to make, just topping the minced meat (usually pork) mixed with shallot and garlic slices onto a large piece of flattened dough, and roll up the two layers altogether, before putting the long strip into the steamer for 20 minutes. The strip looks just like a lazy dragon and hence its name. Of course, it is chopped into slices afterwards, or it would be quite difficult to eat. You can either try it at the chain restaurant named Dalanlong or buy it at convenience stores like 7-11 or FamilyMart.